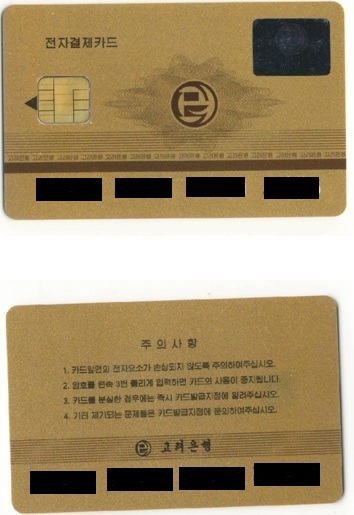 Dr. Bernhard Seliger of the Hanns Seidel Foundation writes in to notify us about the DPRK’s new Koryo Bank (고려은행) debit card. Click image above to see the front and back of the card. * Electronic Paying Card is a cash card with which cardholders can make a payment when buying a merchandise or receiving a service instead of money. We provide the very best customer service, convenience and security. * Cardholders (including foreign cardholders) can freely make a payment in foreign currency at electronic paying card affiliates. 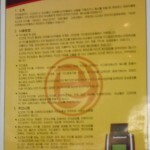 *Issuing a card and making a deposit: Card is issued at Koryo card issuing branches. Foreign currency is converted into equivalent North Korean won at a current exchange rate (purchasing price) when cardholders or to-be make a deposit. Issuing a new card is free of charge. Issuing a card, cardholders should register a private password to prevent use of a third party. Using the card cardholders should remember the password to verify identity. *Procedure of the payment: Card holders are allowed to purchase goods and services within the available balance of the account. Card payment machine verifies identity by crosschecking with the password you enter. If the information is confirmed to be correct upon identification, merchants or acquirers proceed to make the payment. After purchasing, the balance is diminished by the payment. *Cash Withdrawal: Cardholders who want to withdraw a part or the entire of the remaining balance can be served at Koryo Bank Card issuing branches. The exchange rate is the current selling price. 3. Notice: Cardholders observe the followings as regards to using the card. *Due to its delicate electronic procedure while the card is to be used, it is recommended not to damage the electronic part of the front. *Remembering and entering the password correctly is important, since the payment procedure is suspended after 3 times of password errors. *If the card is destroyed or lost, cardholders should go to the Koryo bank where the card is issued and report the loss and the damage. *With verifying identity and the balance of the card, a new card is issued. *Cardholders shall remain liable for the loss incurred by their negligence. *When there is a question, a loss, duplication or a lost electronic paying card, Call 462-6315. This is not the only debit card available to foreigners in the DPRK. 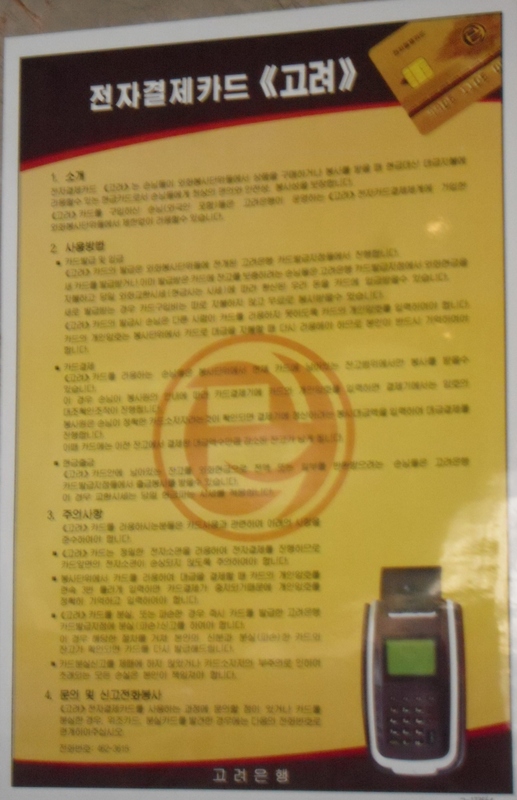 Dr. Seliger also wrote in earlier this year to inform us of the DPRK’s Narae (나래) debit card. Here are previous posts on Koryo Bank. This entry was posted on Wednesday, October 12th, 2011 at 11:42 pm and is filed under Banking, Finance, Fiscal & monetary policy, Hanns Seidel Foundation, Koryo Bank. You can follow any responses to this entry through the RSS 2.0 feed. Both comments and pings are currently closed.